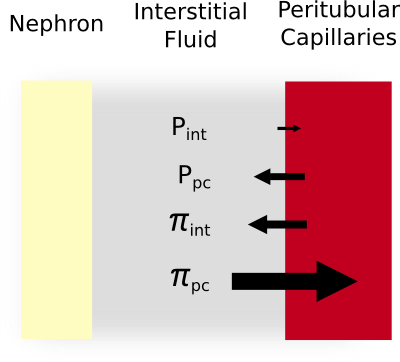 Ultimately, water and solutes transported past the nephronic barrier and into the renal interstitial fluid must be resorbed by the peritubular capillaries. Resorption of water and solutes by these capillaries occurs completely passively and is purely governed by movement of molecules down their electrochemical gradients. In the case of water and sodium, resorption of these molecules appears to be governed by the starling forces surrounding the peritubular capillaries. Several factors can modify the variables of the peritubular starling forces and in so doing can modulate net fluid resorption by the kidneys. As a result, peritubular capillary transport is an important, although under-appreciated, locus of renal regulation. 928;pc) and a low hydrostatic pressure (Ppc). In contrast, the interstitial fluid oncotic pressure (Πint) and hydrostatic pressure (Pint) are relatively low. Overall, the balance of starling forces is toward movement of sodium and water into the peritubular capillaries. The sizes of the arrows above are roughly proportional to the average peritubular starling forces operating in a healthy kidney. The peritubular starling forces are a specific instance of the general Starling Forces (see page) and depend on the relative hydrostatic pressures between the renal interstitial fluid and peritubular fluid as well as their relative colloid oncotic pressures. The filtration coefficient (Kf) of the peritubular capillaries is relatively high because of their extensive surface area. A few unique aspects of the peritubular starling forces are worth mentioning. First the oncotic pressure of the peritubular capillaries is relatively high because a significant percentage of the vascular fluid is filtered out in the glomerulus and into the tubule, leaving a higher-than-normal concentration of plasma proteins in the blood entering the peritubular capillaries. Secondly, the hydrostatic pressure of the peritubular capillaries is relatively low because much of the intravascular pressure is lost after blood passes through the afferent and efferent arterioles. Given the high oncotic pressure and low hydrostatic pressure of the peritubular capillaries, there is a large net starling gradient for fluid resorption. Changes to the peritubular starling forces can have profound effects on renal resorption of water and sodium. If net peritubular resorption is decreased, water and sodium will begin to back-leak into the tubule, resulting in increased urinary loss of these molecules. This is most true in the proximal tubules which have relatively leaky tubular tight junctions. The two starling variables that are most prone to change are the peritubular hydrostatic pressure and oncotic pressure. The peritubular capillary hydrostatic pressure depends on the incoming systemic arterial pressure as well as the extent to which this incoming pressure is dropped by the resistances of the renal afferent and efferent arterioles. Lower incoming systemic arterial pressures or increased renal afferent/efferent arteriolar resistances decreases the peritubular hydrostatic pressure and thus enhances peritubular resorption. The converse is also true. Indeed, the increased urinary loss of water and sodium observed when systemic arterial pressures increase, a phenomenon known as Pressure Natriuresis (see page), is largely thought to occur by increasing the peritubular hydrostatic pressure and thus reducing the starling gradient for peritubular water and sodium resorption. The peritubular oncotic pressure depends on the oncotic pressure of the incoming blood as well as the fraction of fluid that is filtered out at the glomerulus, termed "Filtration Fraction". A higher filtration fraction concentrates plasma proteins to a greater extent and thus enhances the peritubular oncotic pressure. In general, higher efferent arteriolar resistances increases the filtration fraction by increasing the GFR (See: Glomerular Filtration Rate), thus boosting the peritubular oncotic pressure and in turn peritubular resorption. Indeed, one of the mechanisms by which Angiotensin II is thought to increase renal sodium resorption is by enhancing efferent resistance, in turn boosting the filtration fraction, resulting in increased peritubular oncotic pressure, and thus increasing peritubular sodium and water resorption.